This hearing accessible two room suite features one king bed and a roll in shower. The king bed two room suites are beautifully decorated. A door separates the bedroom from the living room. Each bedroom includes the comforts of king-size beds with luxurious linens, with custom bolster pillows, 55-inch TV, alarm clock radio, work desk and phones with voicemail. The living room features a sleeper sofa, 55-inch TV, minifridge, phones with voicemail, iron, ironing board, and hair dryer. Any corresponding photo may not reflect the specific accessible room type or room feature. 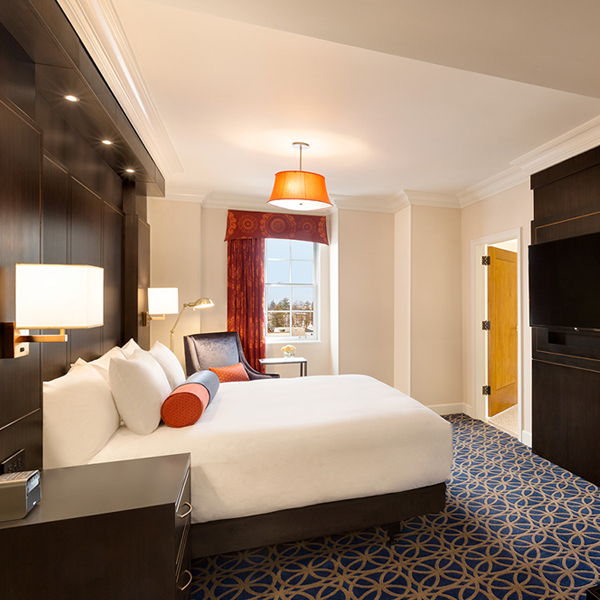 Our hearing accessible deluxe two room suite features one king bed and a roll in shower. The king bed deluxe two room suites are beautifully decorated. A door separates the bedroom from the living room. Each bedroom includes the comforts of king-size beds with luxurious linens, with custom bolster pillows, 55-inch TV, alarm clock radio and phones with voicemail. The living room features a sleeper sofa, 55-inch TV, dry bar, dinning table for 4, minifridge, phones with voicemail, iron, ironing board, and hair dryer. These guest rooms are located in the Compass Point suites building. Any corresponding photo may not reflect the specific accessible room type or room feature. Our hearing accessible deluxe room features a king bed and roll in shower. The king bed deluxe guest rooms are beautifully decorated and include the comforts of king-size beds with luxurious linens, along with custom bolster pillows. Each guest room offers a 55-inch TV, work desk, , minifridge, phone with voicemail, iron, ironing board, and hair dryer. Any corresponding photo may not reflect the specific accessible room type or room feature. Our hearing accessible standard room features a king bed and roll in shower. The king bed guest rooms are beautifully decorated and include the comforts of king-size beds with luxurious linens, along with custom bolster pillows. Each guest room offers a 55-inch TV, alarm clock radio phones with voicemail, iron, ironing board, and hair dryer. Any corresponding photo may not reflect the specific accessible room type or room feature. Our hearing accessible standard room features two queen beds and an accessible tub. The two queen beds guest rooms are beautifully decorated and include the comforts of queen-size beds with luxurious linens and duvets, along with custom bolster pillows. Each guest room offers a 55-inch TV, work desk, minifridge, alarm clock radio phones with voicemail, iron, ironing board, and hair dryer. Any corresponding photo may not reflect the specific accessible room type or room feature.